Bless Your Heart has a white base with pink and red hexes and red hearts. All nails are 3 coats with a top coat of Seche Vite. 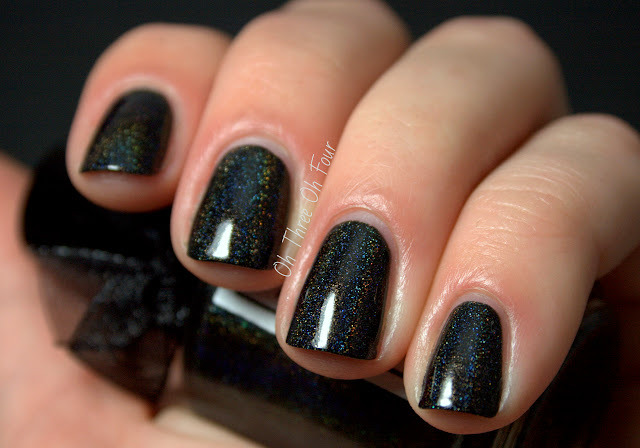 Lexis is a black holographic polish. All nails are 2 coats with no top coat. 2 coats of each brand were used in the photo. Lacquerhead Polish can be found on etsy here. Currently Lexis is not stocked yet, I believe it will be $10 for a full size bottle once added (don't quote me on that!) as will all her holographic polishes coming soon. Find Lacquerhead Polish on Facebook here. Currently there is a giveaway running on Facebook for a free bottle of Bless Your Heart and your choice of cuticle oil, be sure to enter!